I’m playing an alphabet game, Liz has given me the letter B so I get to come up with 10 things I like that start with the letter B. One of my greatest passions. I own far too many and I find it almost impossible to get rid of even the ones that I freely admit to being rubbish. See those shelves in the photo? I have 4 more the same, the shelves with paperbacks on them are double stacked and there are piles of books on my bedroom floor which don’t fit anywhere. 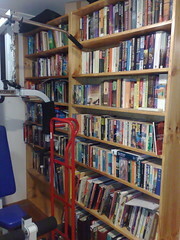 Problem is we’ve run out of walls to put the shelves against. That’s the real reason why I want to build an extension on the house. We’re off to Merry Beach for a week-long camping holiday in a few days time. I’m looking forward to walking on the sand, letting the waves wash over my feet, plunging into the surf and breathing the salt air. I’ll walk to the end of the beach and sit watching the waves breaking against the rocks and I’ll lie in bed at night listening to the ocean (and the possums trying to steal our stuff, if what I’ve been told is true). I’d hardly be here doing this if I didn’t like it would I? 🙂 I love the community of the bloggosphere. I love that it makes me think, prompts me to be creative, encourages me to keep a record of the little things about the kids that are so easily forgotten and, I confess, I love having an audience – yes you, you’re the best! I grew up across the road from the Elouera Bushland Reserve, we played in the bush, I walked to high school along the fire trail through the reserve and bush bashed up the creek when it was too high to cross at the normal place without ending up with wet shoes. 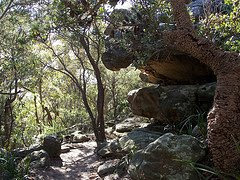 Find a rock to sit on with a view into a gully and sit listening to the birds and let the soft colours of the bush sooth the spirit. Lovely. I’m fussy though, it has to be good beer. Adam is always finding new brews for us to try, he used to do home-brewing too and it wasn’t until I’d tried his home-brewed wheat beer that I began to develop an appreciation for beer. Some of my current favourites are Beez Kneez, Lord Nelson Old Admiral and Lowenbrau’s Franziskaner Weissbier. 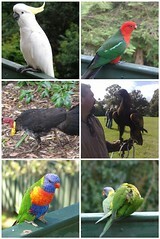 Birds are nice, particularly when they are NOT in cages. Yeah, I’m weird. I once had a boyfriend who played the bagpipes, I went to watch him play in his pipe band one time and they were playing INSIDE a church hall. So wrong. So painful. My family used to go each year to the Bundanoon is Brigadoon festival, we’d camp at a place that was up on the hill a short walk from the oval where the festival was held, it was just the right distance for listening to the pipe bands play. On our front deck on a mild spring day with scrambled eggs, bacon, grilled tomato and mushrooms, toast, a big pot of tea and nowhere to go and nothing to do. Roast leg of lamb seasoned with garlic and rosemary with baked potatoes, sweet potato, pumpkin and whole onions. Accompanied by steamed baby peas, gravy, mint sauce and dijon mustard. OMG YUM! I’m kind of glad I’m here, and that I’m me, and that I have the family and friends I have. Life is good. The version of tagging for this particular meme is much more to my liking – if you’d like your own turn at the alphabet game, you have to leave a comment here letting me know that you want to play and I’ll pick a letter for you. Who’s playing the alphabet game? I agree about birds in cages…well, not in cages. 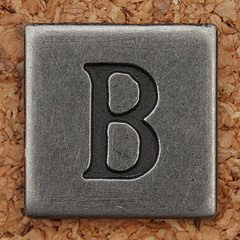 B is also for Beautiful… as in beautful job. I love your list Mim. I also love books, beaches, and if I’d had the bush to grow up around, I know I’d love that too. The jury is still out on bagpipes for me, but I’ll let you know. Oh, and beer… ever try Blue Moon? It’s a great B word and a super popular orangy flavored wheat beer here in the states. Try it. Oh no – not bagpipes!!! It took me ages to come up with this lot, I don’t think any letter is particularly easy! I only moved to our new house on the condition that we got more bookcases — we have five seven-foot high ones and they’re all full, and there are messy piles of books all around the house. And now every time I remind my husband that he promised more bookcases, he says there’s no room. An extension, huh? I *love* it! Hope you get lots more room for books! Am jealous of your south coast adventures. I like it down there. We spent many a christmas at a place just south of Ulladulla. Heaven on earth really. Books, books, books. I love books. Aren’t you kinda/sorta wokring part-time in a bookstore now? I thought that I read that. Yes, we love blogging. My husband says that part of my charm is that I also like beer!